“What moonshine whiskey?” she wanted to know. He explained that it was a hooch made in Virginia and sold in Mason jars. Since he struck out with Mom, he asked my sister to track down a bottle for him. 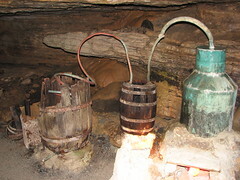 Trust Kelly to know all about moonshine whiskey and to find a docudrama on the Discovery Channel that tells stories about people who produce moonshine. These people brew their own shine – often in the woods near their homes using camouflaged equipment, according to the Discovery Channel website. When Mom got home, she went into her basement, dug out a Mason jar, poured straight vinegar into it, sealed the lid nice and tight, and asked my other brother to take it to Kelly and say she brought it with her from Virginia. When Kelly saw the Mason jar full of brownish-gold liquid, his face lit up like when he was a kid and Santa brought him a BB gun on Christmas morning. The lies began spewing out of her so naturally that it made her a little nervous. “What if you had gotten caught?” he asked. You know that story about lies don’t you? How you can never lie just once because to support the first lie, you have to tell another one, and then another one, until you are nearly a perpetual, pathological liar? My mom found herself in that dangerous lying cycle, but she was having so much fun, she couldn’t stop. The next day when she talked to Kelly, he said, he’d hid the bottle at the back of the fridge so that nobody in his family would find it. He had him some special, illegal whiskey, and by golly, he was going to protect that stuff. “Oh, believe me, I won’t!” his wife said, relishing the fun of it all. I giggle every time I think of him appreciating and protecting his little mountain dew souvenir from Virginia. I really can’t believe he didn’t know it was vinegar! I hate everything about vinegar. I can smell it from across the county, I think. Yet, he smelled it and tasted it, and still thought it was potent moonshine whiskey with a bite? Oh, my. Moonshine whiskey must be some awful tasting, smelling stuff if it’s at all like vinegar. For any of you who know my brother, Kelly, don’t spoil the fun by telling him what’s really in that Mason jar tucked into the back of his fridge. His reaction is sure to be priceless. And can you imagine this sweet lady traipsing through the Virginia hills looking for moonshine? Sounds like my Aunt Helen, who for 70+ years brought her famous homemade pickles to all of the family gatherings. No one wanted any pickles except Aunt Helen’s. As she drew near death at age 95ish, it became time to share the secret recipe. Others had tried unsuccessfully for decades to replicate it. “Oh, it’s easy,” she said. “I just open a jar of Vlasic, put them in an old fashioned rubber gasket canning jar with some extra sugar and green food coloring and bring them to the family picnics.” She kept up the scam nearly 75 years. Since her passing, the family pickles have never been the same. Please share what you end up doing! I totally loved this! I can just picture the whole thing as you tell it. Just so perfect getting Kelly like that. I can see your mom having a great time with that. I was laughing out loud! Karen, thanks for reminding me of this fun memory!! These blogs about my mom are going to be even more cherished now!